It forces thinset into the body of the tile. It completely fills all the little open pores in the back of the tile. This allows the crystals of the cement portion of your thinset to grow more deeply into the body of the tile, leading to a stronger, more durable bond to your substrate. It gives the back of the tile a 100% bonding surface for the thinset on your substrate. 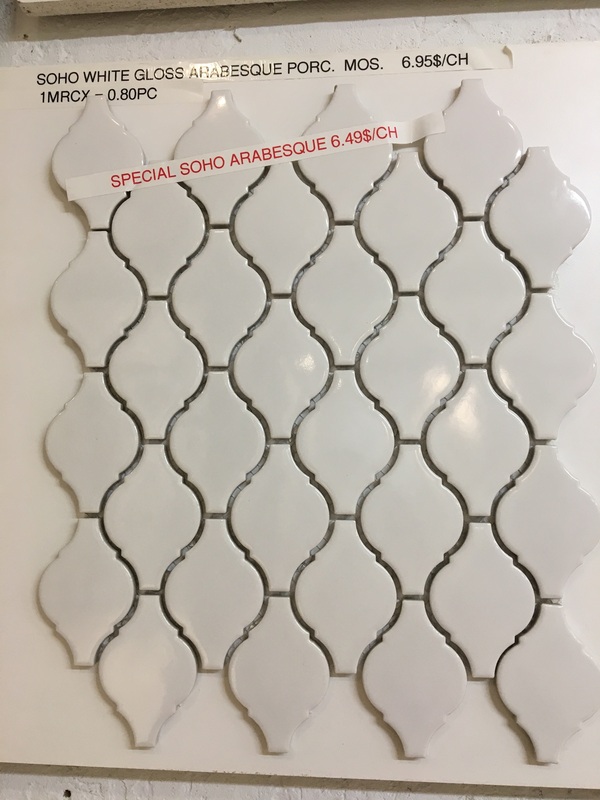 Rather than having areas on the back of your tile which may remain open or unbonded because the thinset cannot fully bond to them, it covers the entire tile with a flat, bondable surface. 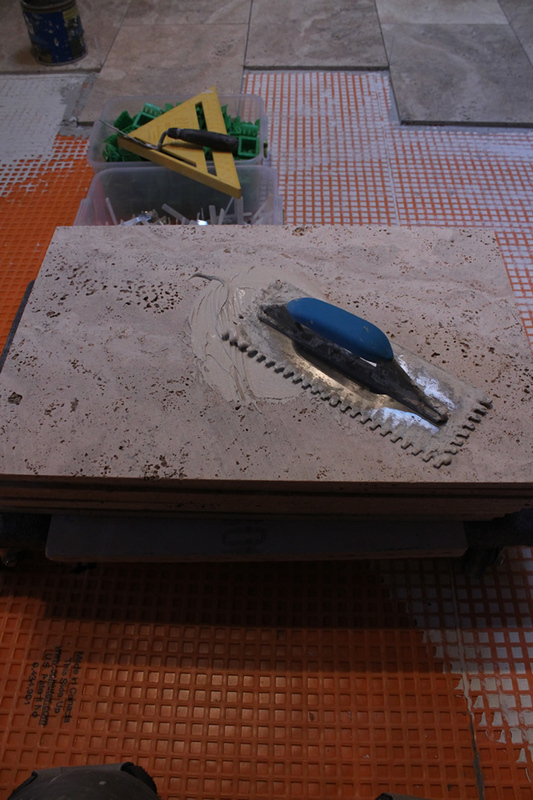 In my photos I am installing a travertine tile, which is a porous natural stone. This will exhibit the need for Backbuttering since you can actually see the open pores in the back of the tile. The same applies to porcelain or ceramic, or any other type of tile as well, just on a more microscopic level. I am also using a tool called the back butter buddy. It’s that turquoise frisbee looking thing (although you may be able to get it in designer colors – I’ll have to ask Phil…). 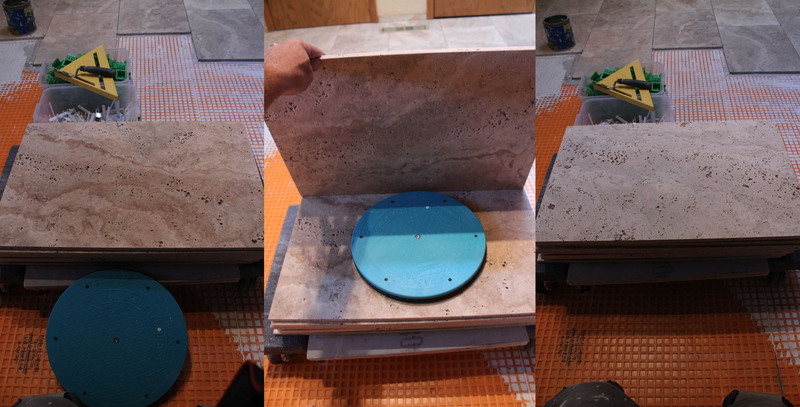 It’s simply a turntable of sorts that you stack tile onto so you can spin it around to spread the thinset. It makes things a lot easier with larger format tiles. 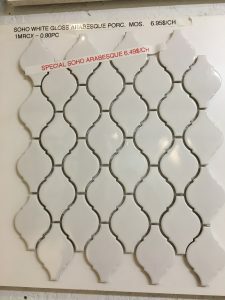 All you need to do is flip your tile over so the backside is up, throw a glob of thinset (that is a standard industry measurement – a glob…) onto the tile and spread it out, forcing it into the body of the tile. 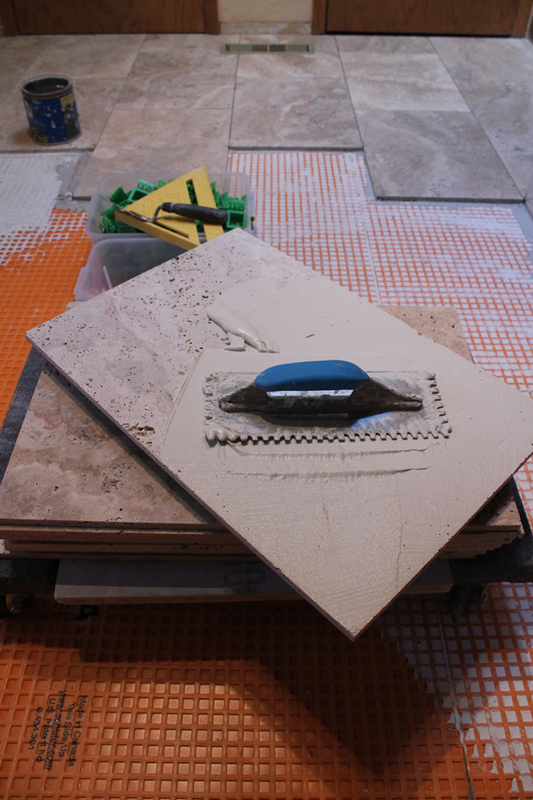 The purpose is to force thinset into the tile, so you want to apply a fair amount of pressure as you’re doing this. tile you’ll end up with a nice bead of thinset along the vertical edge of your tile. It’s difficult to explain – until you do it once. Then you’ll know exactly what I’m typing about. And it’ll piss you off. And you’ll have to flip the tile, clean it off, wipe it down, your dog may burst into flames…it’s a whole thing. So try not to do that. Once it’s evenly coated you can be assured you have a 100% bondable surface on the back of your tile rather than randomly flush surfaces where thinset may or may not bond. Backbuttering is necessary. 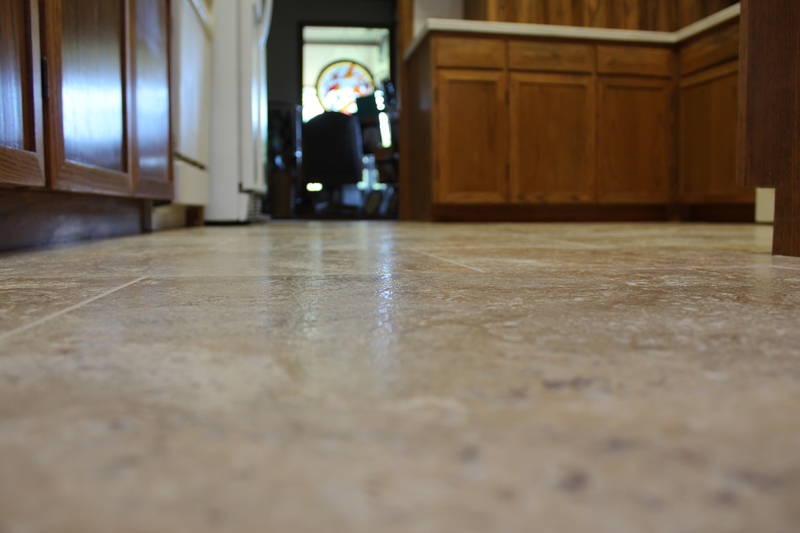 With any tile 12 inches square or larger you need to backbutter your tile to ensure proper coverage. If you do not the thinset may not bond properly to your tile. The photo to the right is a tile I removed from an installation that began having issues – not backbuttering led to a poor bond. While that was not the only issue here, it definitely contributed to the overall failure. The bottom photo is the same issue – but these were installed ON THE CEILING! How long do you think those would have lasted before they came crashing down on someone’s head? In both of those photos you can see that there is VERY little, if any, thinset actually bonded to the back of the tile. Backbuttering is necessary. 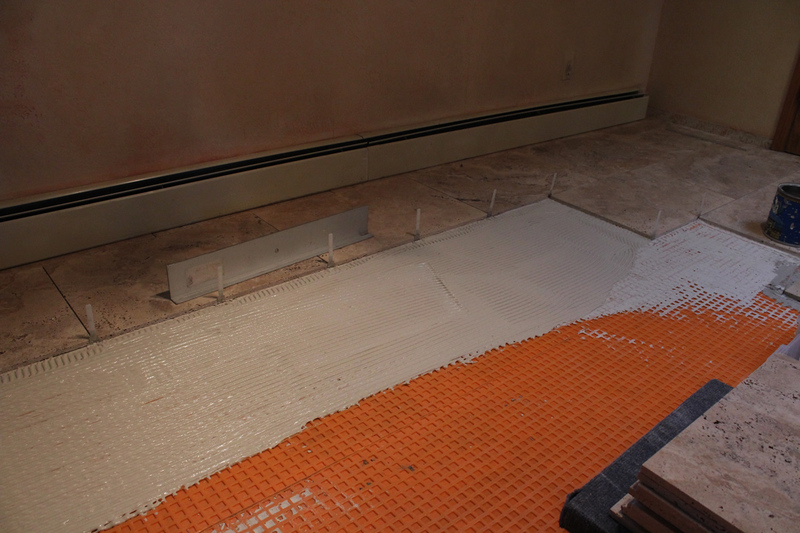 Backbuttering is only one step in the process of a proper tile installation. Every step that is done correctly increases the chances of a successful, long-lasting and durable installation. Every step you skip increases the chances of a failure. So take your time, utilize the proper technique and pay attention to detail. If you do that you and your dog will both live a long, flame-free existence. Thanks for the 101 tips. Very useful tips! I have a question. What do you use to attach “tile bookmarks”? In my shower I have 2 glass mosaic accent strips separated by 8×12 wall tile. The use of these spacers will make this work much better and easier. I have no idea what you mean by tile bookmarks? Do you recommend wetting the tile backs with a damp sponge before back buttering, or is that overkill? If it’s porcelain then yes, it’s overkill. With most modern ceramics it is not necessary, but it doesn’t hurt anything. If it’s a porous bisque tile then it definitely helps. What size trowel do we need to use? 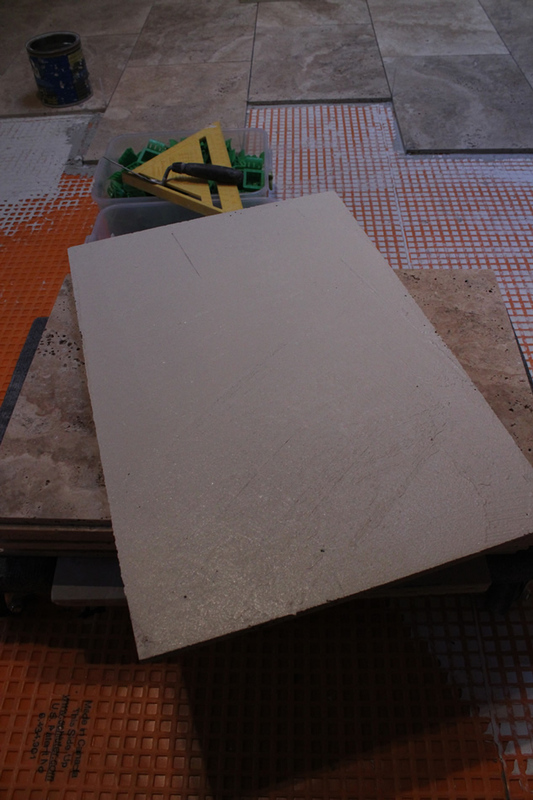 How much thinset do we need to put on the floor surface…..
We will need to back butter with thinset the back of all tiles with the smooth side of the trowel as well? Read through this, it will help you with trowel size. The amount of thinset depends on the size of the trowel. Yes, with tile that size you should backbutter. It can be affected, but likely isn’t. It can absorb moisture and humidity from the air, but that takes over a year of doing so to negatively affect it. Thanks Dan! Glad I could help. great info – how to backbutter a 6 x 36 plank? There could be several reasons it did that. As far as installing new stuff, splash some water on your concrete and see if the concrete soaks it up. It should soak it in with thirty seconds or so. If it does not then that means the concrete was sealed with something that prevented the thinset from bonding to it. If it does soak it in then it is purely incorrect installation in some manner. Either a dirty subfloor, not keying the thinset into the concrete, letting it skim over, incorrect mix, etc. If it does not soak in water then the thinset will not bond well. You’ll need to chemically or mechanically scarify the surface of the concrete to remove that sealer. Thanks for the quick reply Roger! I was thinking the same about prepping it, just wasn’t sure how to test/identify the former issue. I didn’t think the problem was the thinset, since it bonded very well to the tile and it would be odd to key it to the tile back and not the concrete. Any recommendation on the ‘optimum’ method of scarifying the surface, if needed? I currently have a 4″ diamond disc, and the area is perhaps 300 ft^2. I use a 7″ scarifying disc. The 4″ will do it, but it’s a process. 7″ takes about 1/3 of the time. And make sure you have at least a shop-vac hose up to it, a cover that goes over the disk and hooks up to the vacuum is better. It makes a damn mess. Thanks for the great information. Will be back to read / study. Any tip for applying thinset – backbuttering – 6″ x 36″ ceramic plank? glop at one end and …paint roller…? Nope, it’ll end up all over the sides of your tile. I just start at one end and go crosswise over the tile the length of the trowel. Keep doing that until you get to the other end. You want to go the short way, your trowel is longer than your tile is wide, anything wider than what you are trying to backbutter will just make a mess. thanks! just picked up a box and will practice on a plank. Not having done tile, will go slow and practice before going full tilt. by using the butter buddy. Thinset would still be on both surfaces. It works fine, but takes AT LEAST twice as long. On the thickness of the back-butter – how thin should that layer be? I’ve struggled with this from way too much to just a film of thinset. 1/8″ or less, or half the groove depth of the trowel used? It’s just a film of thinset. It is to fill the pores of the tile, nothing more. That is not to say that you can’t add more if needed, and it likely will be, to get the installation flat in certain areas. But for the purpose of backbuttering it is only there to fill any pores or open areas in the back of the tile with thinset. Thank you for continuing with the emails. I don’t do any social media crap, so email is my lifeline. Good writeup about keeping the tile off ones head. Is the back butter buddy a product of the kitchen (lazy susan? ), or can it be purchased? It is tile specific. You can get one here. It’ll be blue instead of turquoise, ’cause I’m special like that. I had to take down a couple of walls that had tiles like the ones you show in your photo. 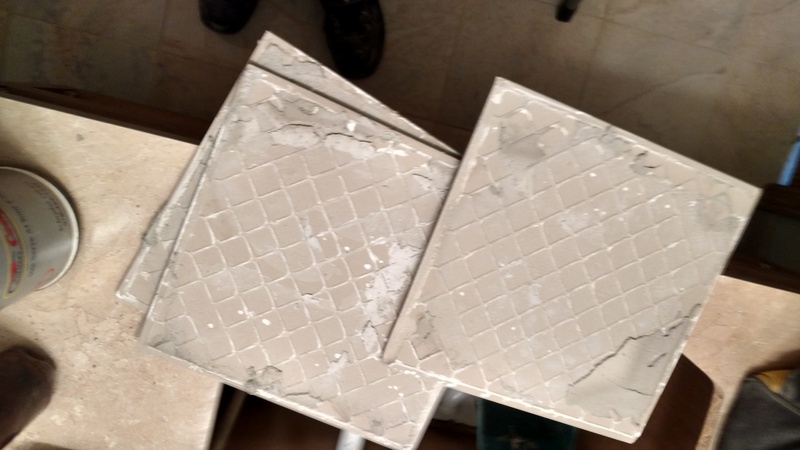 They had not been backbuttered and those tiles popped off with almost no effort, which was why I was redoing what had been done! Which was only a partial part of the total job, as it was failing even before it was finished. The current shower has been up for a couple of years now, goes up 11+ feet on one side, over 9 on another, but still looks like it did when first installed, largely thanks to your advice and guidance. The walls and floor of bathroom are plank tiles, the shower floor proper is mosaic tile. Thanks. good post…although it would be better if you came up with a more precise volume measurement for the “industry standard glob”. is that about a golf ball size or a tennis ball size for a 12″ square tile? It depends on the texture of the back of the tile. I just keep tossing thinset on there until I have the entire thing backbuttered. 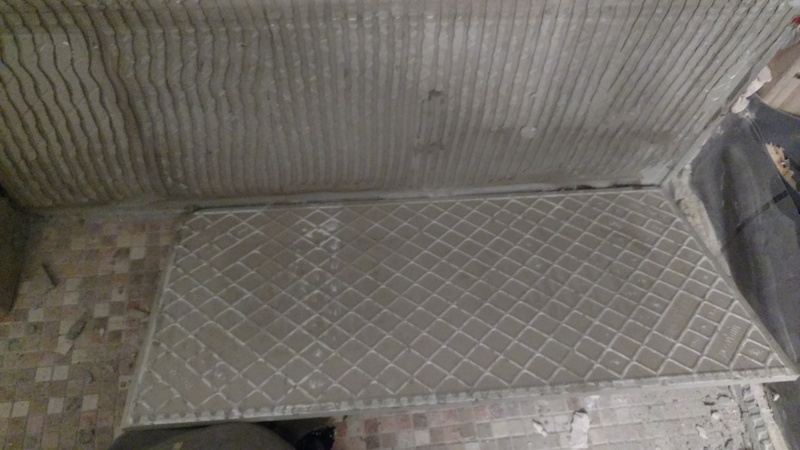 I am in the process of laying tile now, but I have been ‘combing’ the back side of the tile along with the substrate and placing the tile down matching the lines together…..
Is this okay or overkill? It seems to be working for me and I have not had any issues…..??? Would you back butter mosaic tiles on a mesh for a ceiling ? No, I normally only backbutter tiles larger than 12″ square. To put mosaic on a ceiling just ensure that you have them embedded well and every tile around the edge is up well. If one starts to come loose it’ll pull down the entire sheet before the thinset cures. Thanks a lot for the reply! I am a bit unsure when you say 12 inches square. Is it anything 12 x12 or bigger? I am using for my project 12×4 metro tiles (so they are 48 square inches), but inches square are not the same than square inches… Right? Correct, it is different. However, you asked me about mosaics. Is each individual tile in that 12 inches square or larger? 1 inch square mosaics in a 12×12 sheet is 144 individual tiles per square foot – no, you don’t backbutter them. I backbutter when individual tiles are 12 inches square or larger. Or are you talking about two different tiles? If so, no, don’t backbutter the mosaics – yes, backbutter the 12×4’s. I used the term mosaic but the individual tiles are oblong ovals (I had a picture in my original post) and on the mesh it adds up to less than 1 square foot (I also have that in the pic). It is for the ceiling. The wall tiles are 4 x 12 metro tiles. With perhaps an insert of the same mosaic tiles somewhere or not…. It is clear from your reply that I do not need to backbutter the mosaic tiles for the ceiling. Should I backbutter the metro wall tiles? Oh, okay. Yes, you should backbutter the wall tiles.